On Saturday Night the "Change Begins Within" benefit concert was held at Radio City to raise funds to teach Transcendental Meditation to 1 million children worldwide. 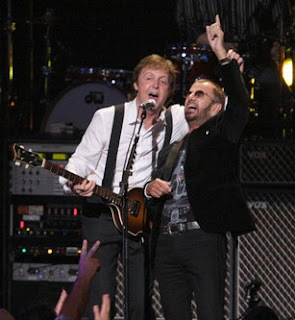 The shows main attraction were the headlining performances of Paul McCartney & Ringo Starr. 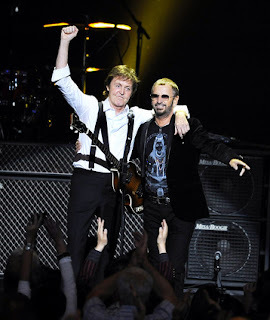 The two have performed together a handful of times since the Beatles breakup, the last time was in 2002 at "the Concert For George". They each played their own sets, then took the stage together sharing the same microphone to sing "With A Little Help From My Friends". They were then joined by an All Star band to perform "Cosmically Conscious" & "I Saw Her Standing There" with Paul on guitar & Ringo on drums. Other performers on the night were Sheryl Crow, Eddie Vedder of Pearl Jam, Donovan, Mike Love of the Beach Boys, Ben Harper, Jerry Seinfeld, Moby and Betty Lavette, & Angelo Badalamenti. Howard Stern & others made speechs on behalf of TM. Inside Radio City, the place was mobbed and I couldn't get to the souvenir stand (the only souvenirs I saw were all Paul shirts and posters). Yoko and Olivia were rumored to be in attendance. Sheryl Crow, performed "Riverwide" with a four piece band. She mentioned George Harrison as a musical and spiritual influence and launched into a very cool rendition of "My Sweet Lord", with Ben Harper on slide guitar. Laura Dern came out w as kind of goofy but likable; and introduced Jerry Seinfeld. He did stand-up for a few minutes & was hysterical. If his show was that funny, I would have watched it. After Seinfeld, Eddie Vedder performed solo,(acoustic guitar, mandolin) and then he did this vocal/wailing thing that kept recording and overdubbing him, by the end, there were several "Eddie Vedder's" singing. Very impressive. Ben Harper came out, with his band, "Relentless7", and then with Vedder, they performed Queen/Bowie's "Under Pressure". Very well done. Mike Love, who seemed frail and short winded, made a speech. Then Donovan came out, there were technical problems with the mics and his voice seemed a little wobbly on "Hurdy Gurdy Man". Donovan's voice was back for the next songs, "Wear Your Love Like Heaven", "Season Of The Witch" (a duet with Sheryl Crow) which was pretty good, although it was funny watching him and Sheryl dancing together. Howard Stern made a speech, and then it was time for Ringo. He opened with "It Don't Come Easy" with Eddie Vedder, Ben Harper and his band backing him. 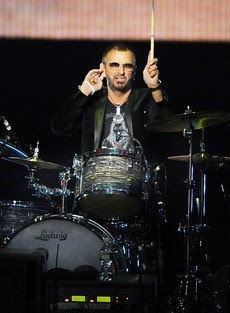 Typical Ringo performance, which means it was fun. He mentioned how George helped him write the song. He said he took what he had of the song to George for help because everything he wrote himself sounded like Bob Dylan with 87 verses. He also said that George wanted to sing about God and Krishna on the song, but Ringo said no. Then he went on the drums and did "Boys" with Harper/Vedder supplying the "Bop Shoo Wops". He came up front and with Sheryl Crow joining on backing vocals, he did "Yellow Submarine". After several more speeches, Paul came out to the biggest ovation of the night. He looked great and sounded better than I've heard him in years. He had his regular touring band with him and they were great, as usual. 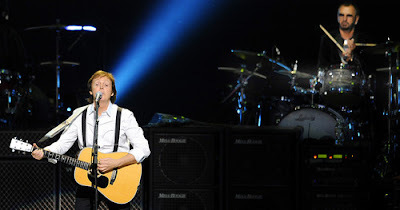 He opened with "Drive My Car", and (in no particular order) he performed "Jet", "Band On The Run", "Got To Get You Into My Life", "Can't Buy Me Love", "Here Today", "Blackbird", "Let It Be", and "Lady Madonna". Then came the moment I paid $365 for: He said, "I'd like to bring somebody out now. You've seen him tonight- Billy Shears... " I don't know if he even said Ringo's name, because the crowd went crazy. (I'm getting chills now just writing this) Ringo came out, gave Paul a hug, and they went into "With A Little Help From My Friends" with Paul and Ringo sharing the same microphone. Whe n they finished the song, they hugged again and brought everyone else out for a bow. They left & returned for an encore, with all the performers and Mike Love. When everyone noticed Ringo was on the drums, there was another big cheer. They did "Cosmically Conscience" and finished with "I Saw Her Standing There". Bows, hugs for all the performers (including an "I am not worthy bow from Sheryl Crow to Ringo). A funny moment where Paul was out front taking in the applause, and then Ringo stood directly in front of him to take in the applause, and then Paul stepping in front of him, and so on. Seeing those two together made it a marvelous night. As for my disappointments: Sheryl Crow should have sang more of her stuff; Donovan should have done one of his bigger hits ("Sunshine Superman" "Mellow Yellow" "Atlantis") More Ringo; and "Yesterday" & "Hey Jude" as the final encores. Otherwise, an amazing night.